What are One Rock Dams and Pumice Wicks? 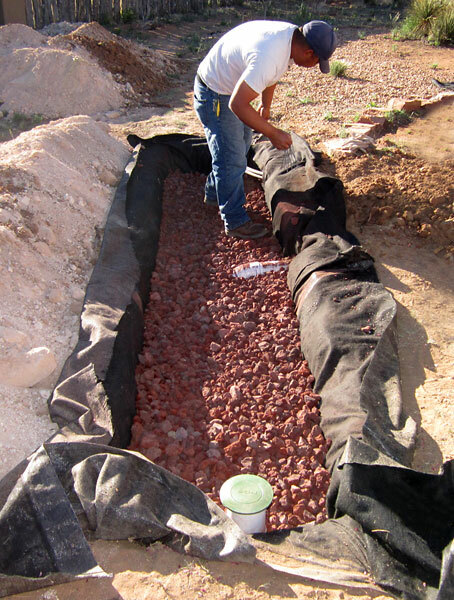 One Rock Dams, or “ORD” structures, are simple water harvesting techniques that work extremely well in our high desert ecosystem. 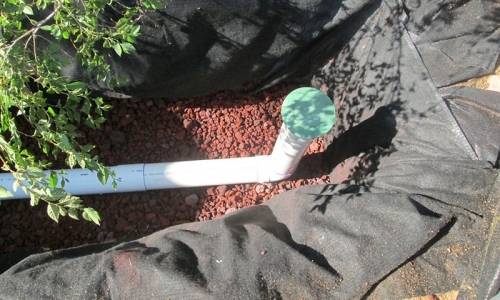 The basic principle of water harvesting is to capture runoff water as high in the watershed as possible. This allows for infiltration and sediment control before water has a chance to move through the ecosystem, gathering speed and energy for erosive effects. 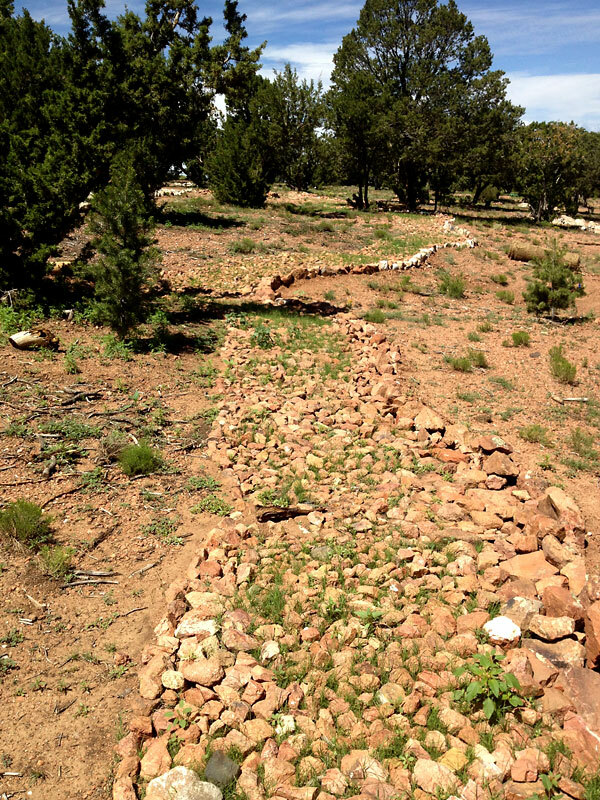 One rock dams are simple rock structures that are laid on contour, acting as a swale, but unlike a swale, ORD structures capture water and sediment at the same time. 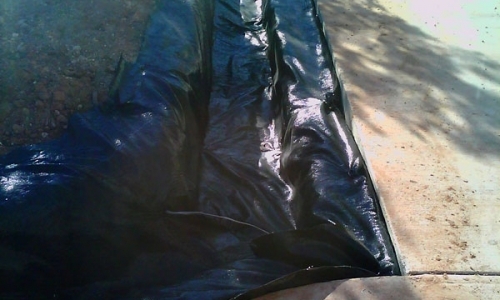 This minimizes sheet flow capacity to carry sediment, and cause more erosion. 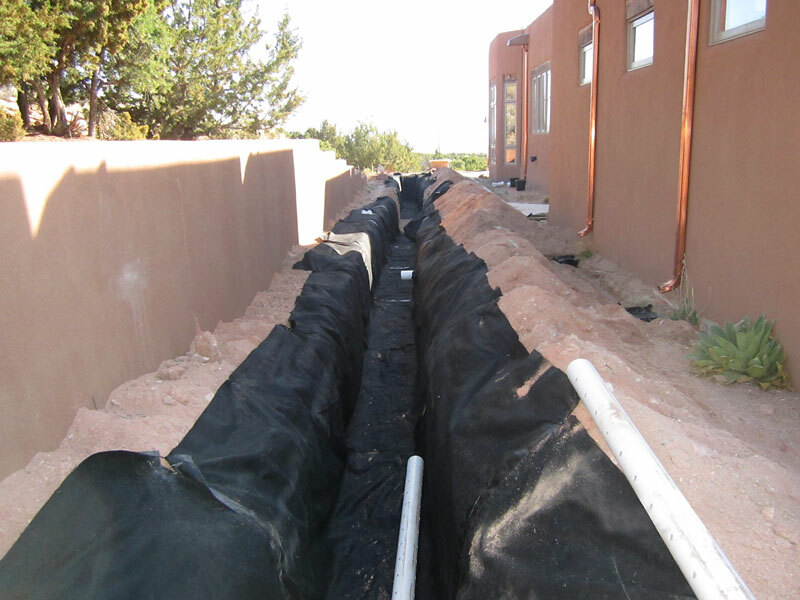 By harvesting water and sediment before it gets to a larger drainage, we eliminate the ability of the water to gain momentum. 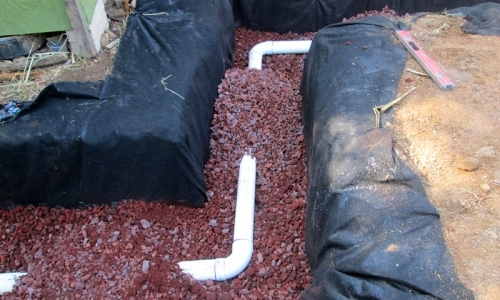 One Rock Dams also act as a mulch, keeping the sun and wind away from the soil. This creates a wonderful nucleus point to germinate and establish native grass, shrubs and wildflower seeds. 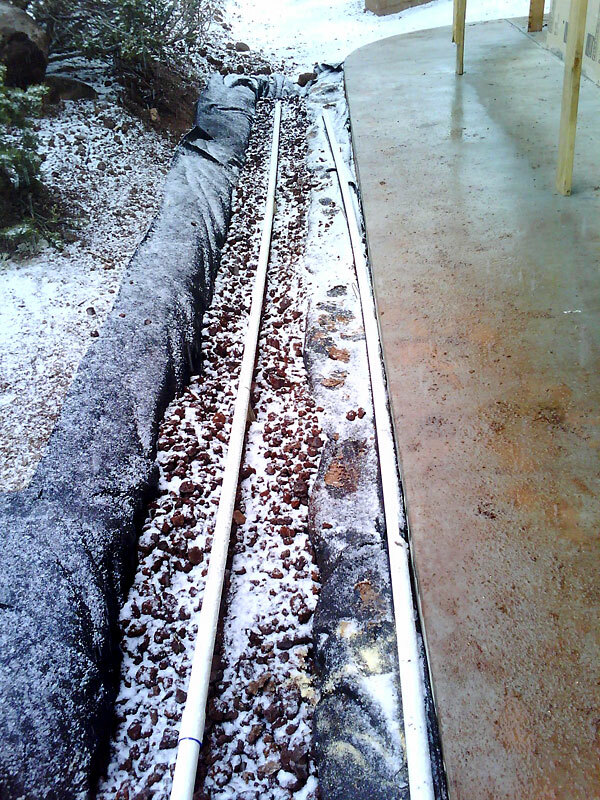 As the seeds germinate, they push up between the rocks and form a thick, dense vegetative cover that is not only capturing water runoff, but also controlling the movement of sediment. 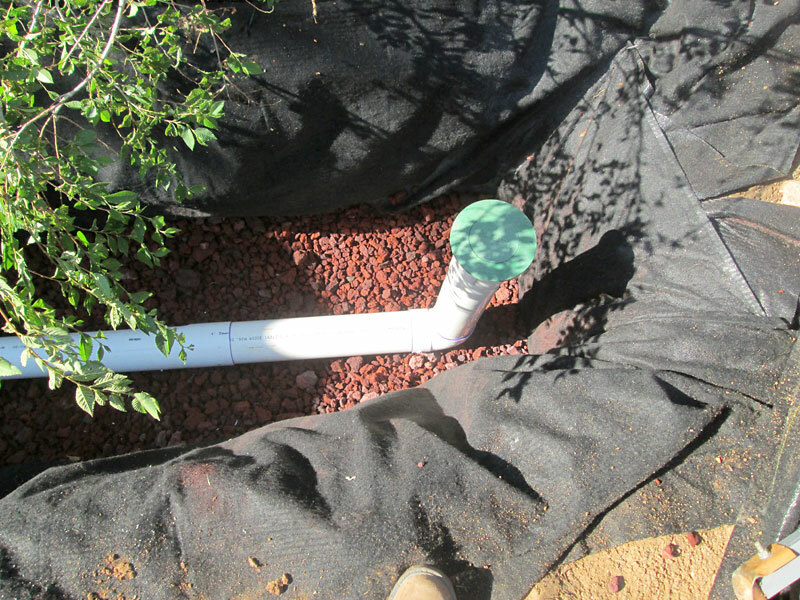 This holds more and more water each time it rains and will grow more vegetation with each rain as well. As the vegetation establishes, it will continue to spread into the landscape. ORDs also help keep native plants and seeds safe from herbivory. Once established, the ORD structures will begin to disappear as the vegetation takes over. 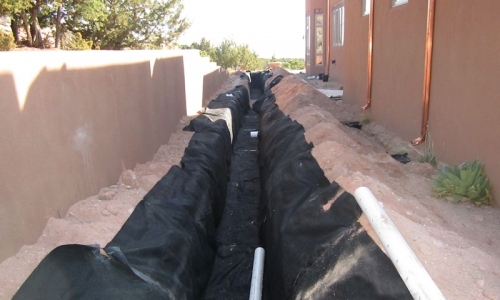 ORD structures are mainly constructed in the upper watersheds, or areas above where obvious erosion has taken place in a drainage. 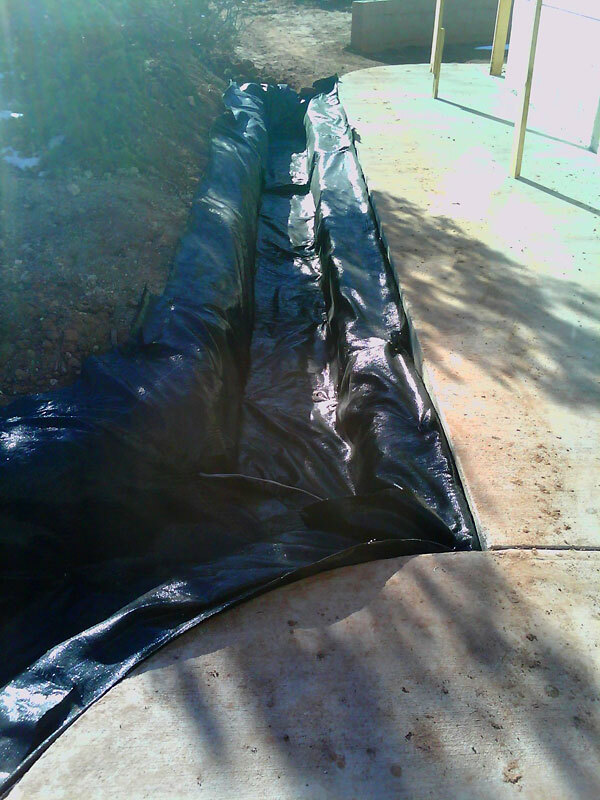 This keeps water from actually entering the drainage by flowing over the surface, and helps stormwater to reach the drainages by moving underground. The key to all erosion issues is the establishment of vegetation. Roots of native grasses and other shrubs and plants, keep the soil held in place, which grows healthy soil by adding organic matter. Once organic matter is incorporated into the soil, it helps with water infiltration and water retention. This helps the microbiology of the soil which in turn supplies more nutrients to the plants, and a soil food web cycle can be established. 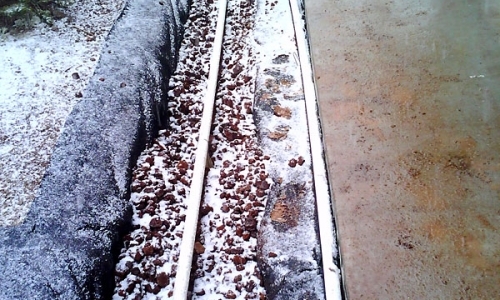 Pumice wicks are underground water infiltration devices, that can take water off impermeable surfaces such as rooftops and concrete patios, and divert it directly into the soil. 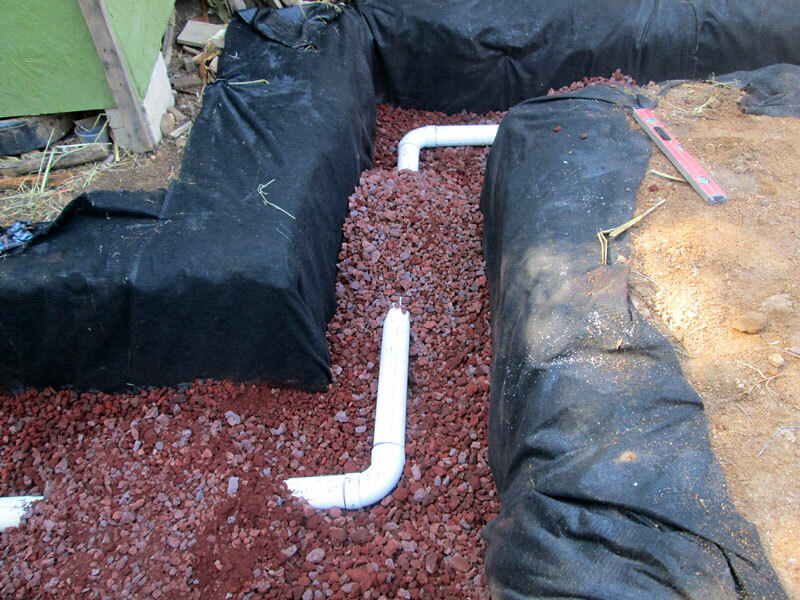 The wonderful part about a pumice wick is that it can be constructed so that it takes a large amount of stormwater and spreads it evenly throughout a large area of soil. 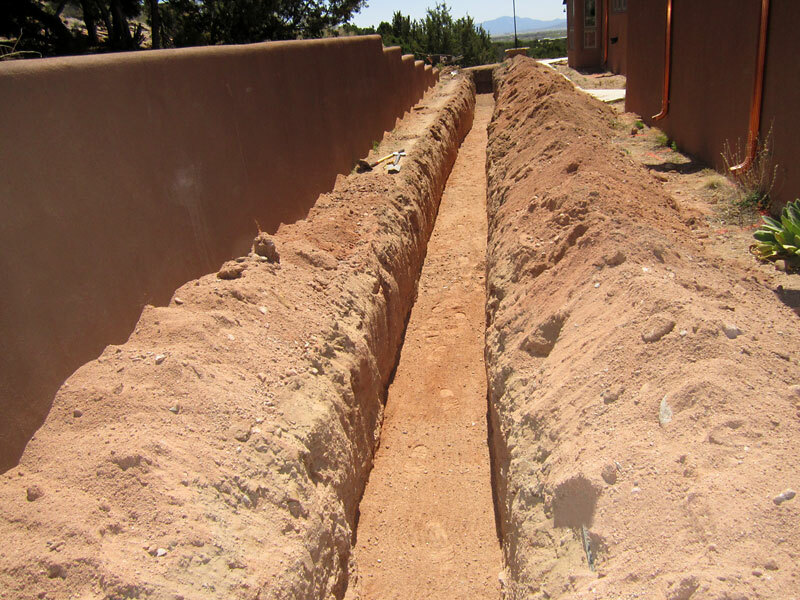 In general, a pumice wick consists of the following: A trench is dug, usually about 2’ deep and 2’ wide. 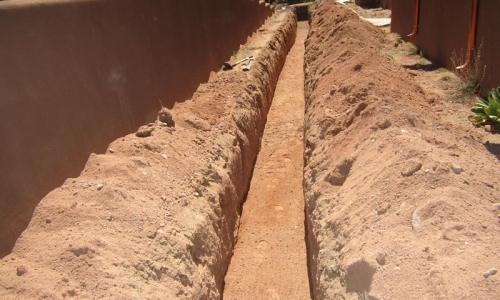 The trench can be in most any shape, and as long as needed to be capable of infiltrating a large storm event off a specific impermeable surface. 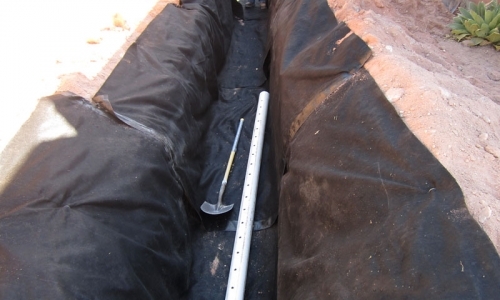 The trench is then lined with a geotextile fabric which allows water and air through, but not roots and soil. This protects the longevity of the wick, by allowing plants to grow in and around the wick, but not fill the space with roots and soils. The wick is then filled with a pumice rock or ascoria rock, both volcanic which are in some cases more than 50% air space. This air space in the rock allows for a lot more water to fill the wick than if it were filled with a non porous substance like 1” river rock. A perforated pipe is then installed on the top of the wick, perfectly level, so that it can spread the water through out the wick. As the water is spread out evenly, it makes it much easier to create planting areas that are spread out over larger areas, instead of concentrating the water in one single spot. 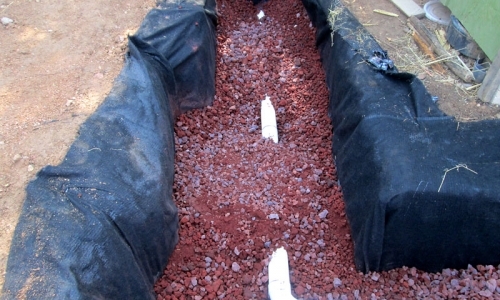 Once the wick is complete, it is buried and covered with soil. Now there is a space in the ground where water is stored and is protected from the sun and wind and evaporation. 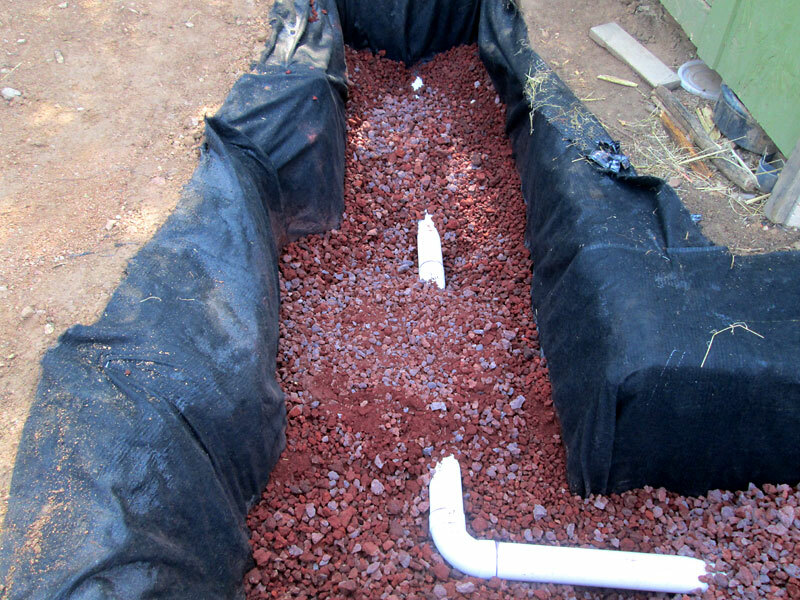 Water can stay underground for months using pumice wicks, where in most cases it would run off the soil and be lost within a few hours. A pumice wick trench has been dug, usually about 2’ deep and 2’ wide. 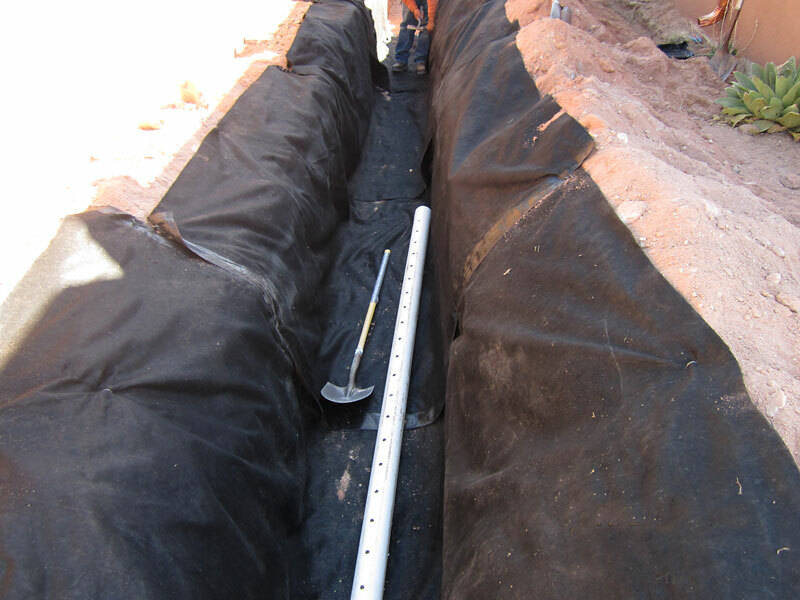 The trench is lined with a geotextile fabric. ...but not roots and soil. The wick is filled with volcanic pumice rock or ascoria rock. The volcanic rock has up to 50% breathable air space. A perforated pipe is installed on the top of the wick, perfectly level. The perfectly level perforated pipe spreads water throughout the wick.